Once you've worked out what audience your plan needs to be focussed at and therefore what type of plan you need to produce, you are ready to start creating a project plan. Now the detail of this will be dependent on where the project is at. Sometimes Organisations decide they want the project initiated together with detailed plans before any requirements have been defined. As you can imagine it is almost impossible to achieve this to the accuracy usually required. However thankfully many Organisations do realise this and allow some requirements to be defined before planning begins. So the rule of thumb is that, if the Business Requirement Specification (BRS) has been approved then it is possible to generate a high level plan from this. However if the project has moved a step beyond this to specific Use Cases and Requirements being detailed and approved then a much more detailed plan will be required. This plan should be of such detail that is can be baselined and used to report against. Now no matter what kind of plan you are able to document key to this process will be the input from the various teams who will need to do work. After all whilst this project and the work involved may be new to you, it certainly will not be to them. Further not only will they be able to understand the work breakdown structure required, ie what work needs to be done when, but also they will have a much clearer idea than you in estimating the task duration and resource required to deliver them. So ensure you get them involved in the project planning as soon as possible. 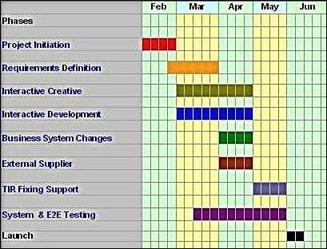 Now assuming you have got their input you would start by doing a high level milestones plan much like the one below just to see how feasible the time frames are. Basically by putting in slots for work it is much easier for individual teams to see where and for how long they will be expected to have resource working on the project. As you will see from the example above, this high level plan immediately gives a visual impression of the phases the project will be working through, plus as will immediately be evident you can see just how many workstreams are overlapping. This immediately tells you that this is going to be a project of high risk because a slippage by one workstream will mean the entire project timeframe becomes unachievable. Once you have this you can then move onto write a project plan using Microsoft Project where the fun really starts! Always try to detail a high level project management milestone plan. It immediately informs you where your project planning risks lie which enables you to immediately start managing expectations. Plus it's really easy to devise using Microsoft Excel.